This book should be looked at from two points of view. First of all it is an interesting history of the times in which Jesus lived. 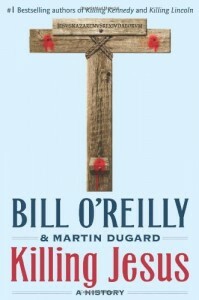 I found the other “killing” books (Lincoln & Kennedy) to be interesting history as well (I’m not sure whether O’Reilly or Duggard is the historian). The book is filled with much Roman and Jewish history and custom so that regardless of one’s religious point of view, the book would be interesting. On the other hand, if you are reading this book as a Christian looking for insight into or bolstering of your faith you will be disappointed. It is rather written as a historian would see the life and death of a revolutionary. Even the last line of the book is, “to this day, the body of Jesus of Nazareth has never found.” But I must add that the “Afterword” of the book explains that the view of the Scripture is that Jesus rose from the dead. Of course, the Afterword also contains much Catholic theology including the bodily assumption of Mary. The text of the book, however, treats miracles as “allegedly,” “seemingly,” “witnesses say,” and also, “the legend of raising Lazarus.” Jesus is basically presented as a revolutionary who accomplished his purpose that God wanted him to do. At one place, “James and John asked the Nazarene if they can be his principal assistants in the new regime.” The book doesn’t deal at all with sin, salvation, or the promises of a resurrected Messiah. The best statement was, “To claim he is the Son of God would make Jesus one of three things: a lunatic, a liar, or a divinity who fulfills Scripture.” You would have to decide what “a divinity” means. I think that when you write mere history about the killing of Lincoln or Kennedy, a sort of historical fiction works well, but when you are writing a story that parallels the inspired gospels, it becomes very difficult to measure up.